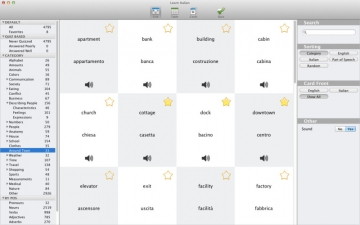 [無料] Learn Italian | Mac App Storeのアプリ検索・ランキング BuzzMac! 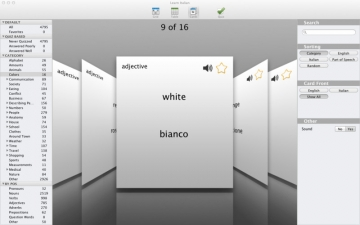 Learn Italian is a flashcard program for Italian vocabulary that teaches you ★efficiently★. This app comes with around 200 cards absolutely free, complete with native Italian and English pronunciation of the words! 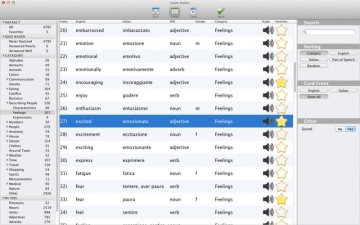 Try out the app, and if you like how it works, you can upgrade to get over 4500 total words in various categories! There is no fluff, no distractions, just knowledge flowing straight into your brain. 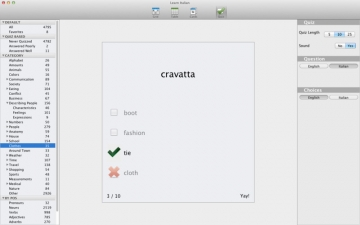 Using the dynamic quiz feature, you can fly by stuff you already know and focus on new material. ► Select categories you care about, such as "Animals" or "Eating"
We will continue to improve the app, so you can be sure this will be a great resource for you to learn Italian! If you have any problems at all with app, or would like to see something more before purchasing, don't hesitate to send us an email. We love hearing your suggestions and will do our best to get them in soon!